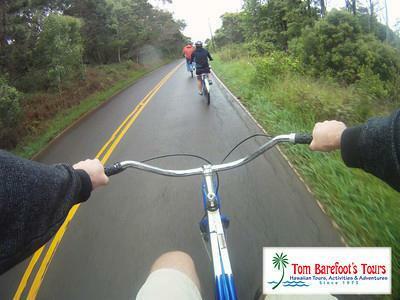 We showed up at the Outfitters Kauai office in Poipu at just before 6AM to check in for their downhill bike trip. 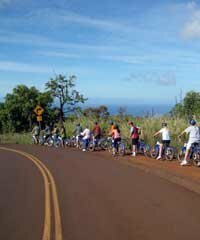 The ride goes down the road along the rim of the Waimea Canyon. A couple weeks ago I went on a hike along the opposite rim of the canyon, so I knew what kinds of incredible landscapes we would encounter on today's bike ride. It was a rather grey morning at the headquarters in Poipu so I was a little worried that rain could become a factor during the ride. My worries dissolved as we traveled westward towards Kekaha because the weather improved significantly as soon as we got past the town of Kalaheo. Once we reached Kekaha we turned up the hill and our guides began some very interesting narrations. Andy paused to show the group some various trees that we passed on the way up the hill. He shared his wealth of knowledge about Hawaiian plants and history by clearly identifying the species of most of the plants that we passed as well the country of origin. Andy was also able to elaborate on many of the stories behind the plants (which he did). He explained how most of the plants in Hawaii were originally brought to the island by people. He also told us what the original purposes were behind their initial introductions. Until this morning I did not know that all the Eucalyptus trees along the road to the Waimea Canyon were originally planted to help stabilize the soil around the road during its initial construction. I also did not know that the road to the Waimea Canyon was originally constructed to service the elaborate aqueduct system that was in already in place throughout the highlands of Kauai to divert rain water out of the swamps to provide irrigation water for the fields below. The bikes we were outfitted with were purpose built for this trip. They consisted of a beach cruiser style frame with modern breaks and a single gear. As we began our ride down I instantly noticed the massive stopping power that the cable disc brakes provided, which I appreciated. I also liked the wide seats and upright bars. If I were to go off-road or up a hill I would definitely want to ride a bike that was set up differently. However, for the downhill, paved trip we were doing today... these bikes were perfect. "To tell you the truth, I thought that we were going to have to go pretty slow because we were on a tour. I was wrong." I had similar expectations, and was also very happy that we didn't have to ride the brakes the whole way down. Towards the beginning of the trip we didn't go that fast because of the corners. We weren't going slowly, but I was definitely using my brakes. When we got farther down towards the bottom of the road it straightened out and we got to let the brakes go and see how fast we could ride. We finished the high-speed section at the end of the tour and we pulled up at the market where the ride ended. I looked around as I got off of the bike and every single person in the group had a smile on their face. I think it's safe to say that we all had a good time. When I was a kid, my family lived in Kihei on the island of Maui. During the 1990s when I was growing up, Kihei was one of the fastest growing towns in the nation. 12 mile canyon to coast downhill bike ride that's fun and exciting. Bike ride 12 miles down smooth blacktop from the rim of the famed Waimea Canyon at 3500' elevation all the way to the shore of the blue Pacific.